Logic Studio remains fantastic and feature-stuffed, and Logic Pro 9 is perhaps the best all-round DAW you can buy. Well-conceived audio features. Many time-saving new features. New amp and pedal plug-ins. Massive content library. Still good value for money. Amp Designer not as flexible as some third-party options. Still a difficult step up from GarageBand. PowerPC not (officially) supported. Apple's diversification into mobile phones, music retail and the consumer computer media experience led many to speculate that its professional software development would suffer, but this has been far from the case. With new versions of Logic Studio and Final Cut Studio released last month, pro audio and video apps are clearly alive and kicking in Cupertino. Logic Pro 9 is one part of the updated Logic Studio, along with other music-related tools such as MainStage 2, Soundtrack Pro 3 and WaveBurner 1.6. We'll be focusing on Logic Pro 9 here, but note that you can't buy the software on its own. There's a cheaper cutdown version, however, called Logic Express. One caveat to be aware of is that Logic is now officially Intel Mac-only, although internet reports say that it does actually work on PowerPC machines. In the new version, Logic's underlying capabilities remain similar, so you can enjoy a potential 255 audio tracks, 255 software instrument tracks and 99 external MIDI tracks. These are complemented by over 70 effects plug-ins, a bundle of soft synths (including those that are also found in GarageBand) and over 4500 presets. The additional content includes all six Jam Packs (including the Voices package), 16GB of sound effects and 6GB of surround sound music beds. This translates to more than 20,000 royalty-free, tempo-clocked Apple Loops and 1700+ EXS24 sampler instruments. 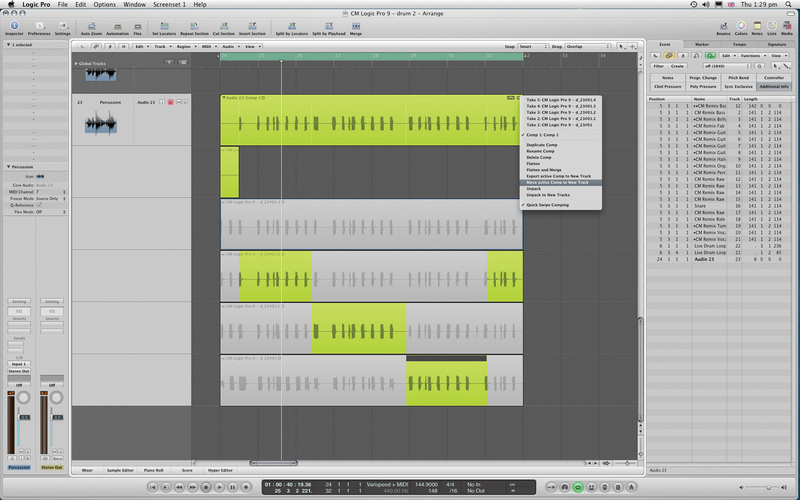 The specs are impressive and, out of the box, Logic Pro 9 has something for everyone. "Although there are subtle changes to a few graphical elements for Logic Pro 9, for the most part, it looks just like its predecessor." There are plenty of other features that make Logic an attractive option. If you're after extra processing power, you can combine networked Macs to share the load. For interfacing, there's solid ReWire implementation, and if you plan to transfer songs to another platform, there's XML, OMF and AAF support. Recording, editing and mixing in surround is also fully supported. The workspace system introduced in Logic Pro 8 now feels like second nature and, although there are subtle changes to a few graphical elements for LP9, for the most part, it looks just like its predecessor. However, there is at least one visually impressive addition: the Amp Designer plug-in. Although Logic already had the basic Bass Amp and Guitar Amp Pro effects, Amp Designer is more like IK's AmpliTube or NI's Guitar Rig, offering 25 amps, 25 cabinets and three mics (condenser, dynamic or ribbon). The elements can be mixed and matched, and the mic position adjusted, and over 200 presets categorised by amp type and style are included. Stomp effects are implemented in a separate plug-in called Pedalboard. This features 30 pedals of various types (distortion, delay, modulation and filter) that you can chain together (up to ten at once), with splitter and mixer modules for creating more complex dual and panned setups. Both Amp Designer and Pedalboard are graphic-rich designs, so although there are no endorsed emulations, the styling makes it clear that classics from Fender, Marshall, Vox and Mesa are among those that have been emulated. Pedal sourcing is less obvious, but with five different flavours of fuzz and multiple modulation pedals on offer, there's a real 'sweet shop' aspect to this plug-in. There are other nice touches, too, such as tempo sync for the modulations and delay, and an adjustable split frequency option on the Splitter device. "Although Logic already had the basic Bass Amp and Guitar Amp Pro effects, Amp Designer is more like IK's AmpliTube or NI's Guitar Rig." Users of Apogee's new GiO controller also benefit from built-in support, including pedal assignments. The only downside is that Amp Designer doesn't enable you to design a stereo rig with two amps, cabs and so on. Sonically, things compare well to bespoke packages such as AmpliTube. Piercing leads (the Brown Stack is particularly nice) and fat modern metal (the Modern American Stack) are complemented by more retro sounds (eg, Small Tweed Combo). On the pedal front, there are a couple of sweet fuzz pedals (Happy Fuzz Face and Candy Fuzz), and we reckon the Robo Flanger is a winner too. Flex Time is Apple's name for a collection of tools that use its new Flex timestretching engine. There are various modes - Slicing, Rhythmic, Monophonic, Polyphonic, Tempophone and Speed - with all but the last designed to help you adjust the timing of audio without affecting the pitch. The options are available from the Inspector window and as a track view (a bit like automation), and there's a new Flex tool on the toolbar. When you select a Flex mode for a track, Logic analyses the audio and creates a set of transient markers and Flex markers. By using the Flex tool, you then adjust the timing between the automatic markers. "Using the Rhythmic mode on multitracked drums, combined with channel grouping and the new phase-locked audio setting, we found Flex Time to be extremely impressive." Stretching on one side of the cursor compresses the audio on the other side, and the stretched section turns orange, while the compressed part goes green. The Flex tool is context-sensitive, so you can add additional Flex markers or groups of Flex markers where you choose. If you don't like the results, you can reset them to the 'neutral' position, delete them or simply deactivate Flex mode. Using the Rhythmic mode on multitracked drums, combined with channel grouping and the new phase-locked audio setting, we found Flex Time to be extremely impressive. The Slicing mode uses exactly the same tools, but you're simply moving audio, not actually stretching it. 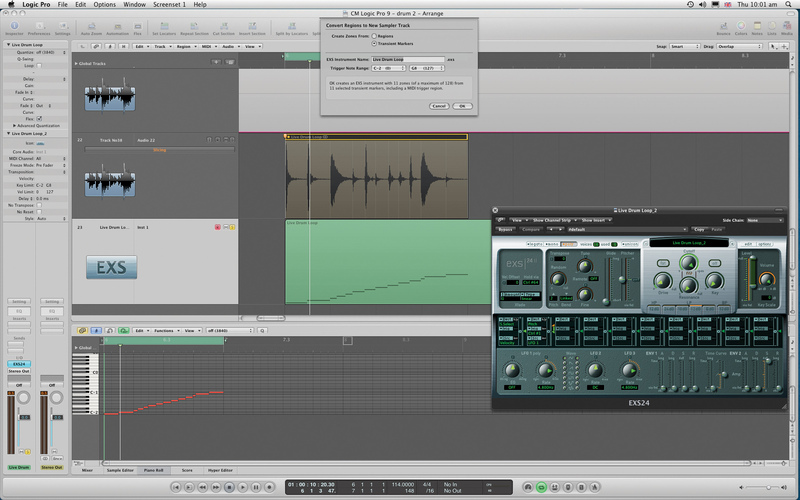 Audio Quantize is a new option that appears once you select a Flex mode. In addition to typical quantise options, you can also apply groove templates derived from other tracks. The Flex Time system offers one more trick: a new varispeed feature on the transport. This enables you to change the speed/pitch or just the speed (timestretching) of the whole song. Although you can still merge audio files using the Glue tool, the new Bounce-in-Place option is better. With this, you can choose whether to include inserts, volume and pan automation, and any effect tail, and whether to create a new track or not. There's a project-wide version that will Bounce-in-Place all tracks, and you can bounce Audio Instrument tracks. The swipe comping system introduced in Logic 8 is slicker now, with the option to copy or move your existing comp to another track - great if you don't want to flatten your comp. Also handy is the Move option, which extracts the used bits, leaving the remainder behind. Space Designer gets some new 'Warped Effects' impulse responses, including drone tones, moving spaces, textures, drum transformers, ghost rhythms and impulses captured from speakers and analogue circuits. And don't forget that Logic Studio includes the Impulse Response Utility for recording and generating your own spaces and effects. One of the most novel new features is the speed fade. When applying a fade-in or fade-out, you can click on the labels in the inspector to reveal the speed-up or slow-down options. Select your fade time as normal and you'll instead get a turntable-style start/stop effect. On the subject of fades, the fade tool is now context-sensitive (Apple refer to this functionality as "click zones"). Combining different projects has never been easy in Logic, but the new selective track import feature resolves this - just use the media browser to find a project and hit Import. This will reveal a list of all tracks, busses, auxiliaries and so on in the project, and you can import the content, plug-ins, automation and I/O settings on a track-by-track basis. The new Drum Replacer and Convert To New Sampler Track features both analyse audio transients and produce a MIDI output. Imagine you have a multi-channel drum performance and the snare sound doesn't cut it. Highlight the snare track and select the Drum Replacement/Doubler option from the Track menu - this will analyse the audio and open a small settings window. Here, you select Snare from the available drum types and also the threshold for the triggering. The transient markers will appear on the region and a newly generated MIDI part complete with EXS24 instrument will open on a track below. It even opens the correct section of the library in the browser, so you can pick a sound. Convert To New Sampler Track is a similar concept. If you have a loop that you want to split into slices, triggering each as a sample, highlight the audio region and select Convert To New Sampler Track from the right-click menu. Select Transient Markers and you'll get a fresh EXS24 and MIDI part on the track below, complete with your loop, split at transient points and mapped across multiple MIDI notes. 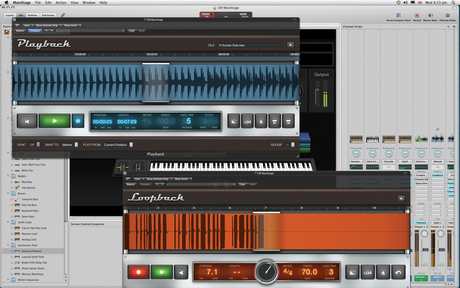 Other software within Logic Studio that will be of prime interest to musicians includes MainStage and WaveBurner. MainStage started out as Apple's attempt to provide all the processing and instrument content of Logic but in a performance-friendly interface for live use. Version 2 adds a couple of nice new plug-ins, namely Playback and Loopback. The first lets you play audio files from within MainStage - import them and MainStage will make up a channel strip and Playback instrument for you. The plug-in reads file markers and loops playback between them, so if you just want to jam, you can load up an Apple Loop, which you can also sync to the prevailing patch tempo. The companion Loopback device appears as a delay plug-in, and to get up and running, you simply insert it on an audio channel strip with your input correctly assigned. The recording process behaves much like a tape loop, so hitting Record and Stop dictates the start and finish. Again, like a tape loop, you can record in a 'sound on sound' fashion, adding audio on top of your original loop. 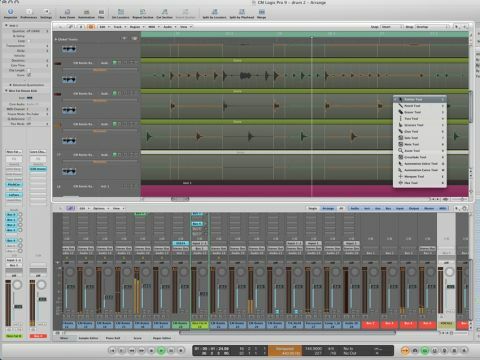 "Other software within Logic Studio that will be of prime interest to musicians includes MainStage and WaveBurner." To make the most of both features, you'll probably want to assign foot controllers to playback duties - a simple matter in MainStage 2 - and if you're an Apogee GiO user, you should be able to do this and run in your guitar all from the one unit. WaveBurner is a CD compilation, mastering and burning app, and v1.6 has parameter automation. You can apply this to region plug-ins on the main waveform lane and master plug-ins on the all-new mix lane. In this latter feature you can also render a full disc-length waveform that includes all the tracks, fades and processing. It may not look that different to v8, but scratch the surface and you'll find that Logic Pro 9 boasts many tasty new features. Existing users will be impressed by the slickness of the audio features, especially Flex Time. For new users, the real attraction is that Logic Pro 9 includes everything you need to make release-quality music. And for the record, Logic Pro 9 didn't crash once during our testing. So, is this release faultless? Not entirely - there's no dedicated drum kit plug-in, for example - but when you sit it alongside all the other production packages, it really feels like the most complete, and for that reason it absolutely deserves top marks. 1. A live drum kit with dodgy playing: first it's fixed with slicing mode, then rhythmic mode. Then, for fun, using pitch mode to show bits speeding up and down to correct the timing, then slowed down with slow-down fade, and sped up with speed-up fade. 2. A melody played on piano with dodgy timing: switching through the flex time modes monophonic, polyphonic, then polyphonic with the complex parameter selected. Next still in this mode, audio quantised to 8ths, then 16ths, then with a silly quantize for fun. All adjustments are made in real time to show the various processing kicking in. 3. A selection of warped effects from Sound Designer: added to a simple bongo, first with the bongo then without.